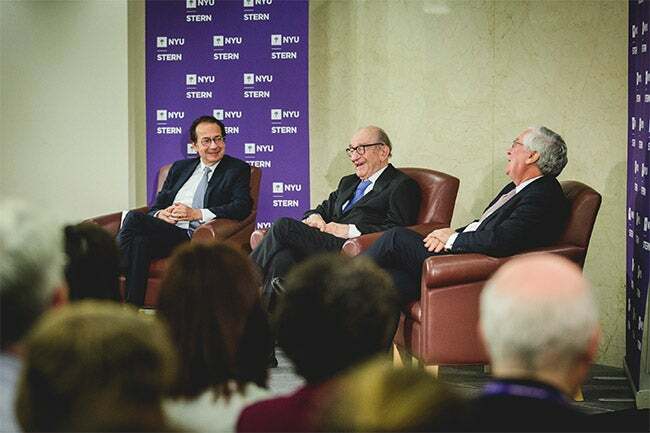 On November 14, NYU Stern hosted the latest installment of the "In Conversation with Lord Mervyn King" series featuring two renowned alumni -- Dr. Alan Greenspan, former chairman of the US Federal Reserve, and John A. Paulson, president of Paulson & Co. Inc., NYU Trustee and member of NYU Stern’s Board of Overseers. On November 14, NYU Stern hosted the last installment of the year of the "In Conversation with Lord Mervyn King" series featuring two renowned alumni -- Dr. Alan Greenspan (BS ’48, MA ’50, PhD ’77, Honorary Doctorate of Commercial Science ’05), former chairman of the US Federal Reserve, and John A. Paulson (BS ’78), president of Paulson & Co. Inc., NYU Trustee and member of NYU Stern’s Board of Overseers. After welcome remarks from NYU Stern Dean Raghu Sundaram, Paulson posed questions to both Lord King and Dr. Greenspan for their perspective as former central bankers. The conversation covered a variety of timely topics related to the US and world economies such as rising inflation, the stability of the euro area, recessions, entitlement spending and the impact of the Brexit vote on the UK. In discussing Brexit, Lord King highlighted that the campaign brought two main issues to the forefront: the loss of national sovereignty and the policies surrounding immigration. While he said he did not believe it would have a major impact on Britain’s economy, he emphasized the central bank’s largest challenge: explaining decisions in a way that people will understand and with empathy. The night concluded with questions from the audience in which Dr. Greenspan spoke about his new co-authored book, Capitalism in America: A History, and revealed the one person he would have loved to meet--Alexander Hamilton.